For primarily outdoor use, the Golden Companion 4-wheel Full Size Scooter sets the standard for full day / full use outdoor scooters. With a 4” ground clearance, there are few obstacles that will stop you from where you want to go. The stability of 4 solid 10” tires gripping the road, you will have the security of knowing you are safe and stable trekking off the paved road and into your lawn or other grassy areas. Available in three models, the Companion scooter has a 3-Wheel Mid-Size, 3-Wheel Full Size, and 4-Wheel Full Size options. 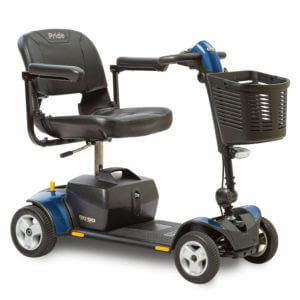 The Companion also features a Delta tiller for comfortable hand placement with easy-to-use forward and reverse levers on long trips; the LiquiCell™ comfort-equipped seat that features six liquid-filled pads to reduce shear and improve comfort hour after hour, day after day; a bright, adjustable LED headlight conveniently placed at the bottom of the tiller to illuminate your path on the darkest of evenings; an instructional DVD packed with every unit so that you can easily understand every aspect of your new Companion scooter; and an easy-to-understand, under-the-carpet troubleshooting guide. For primarily outdoor use, the Golden Companion 4-wheel Full Size Scooter sets the standard for full day / full use outdoor scooters. With a 4” ground clearance, there are few obstacles that will stop you from where you want to go. The stability of 4 solid 10” tires gripping the road, you will have the security of knowing you are safe and stable trekking off the paved road and into your lawn or other grassy areas. While the GC440 does disassemble, a quality Bruno lift is strongly recommended if you plan on traveling.